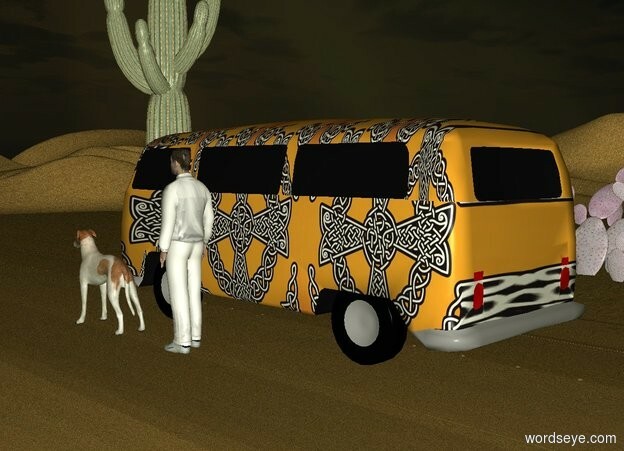 Input text: a road.the road is 3000 feet long.a[paint] vehicle is on the road.the road is sand.a first giant cactus is 10 feet left of the vehicle.a second giant cactus is 25 feet in front of the first cactus.a man is 1 feet right of the vehicle.the man is white.a dog is 2 feet in front of the man.the ground is sand.it is evening.the sun is rust. Is that Boo all grown up? What happened to his companion? Great pattern on the van!